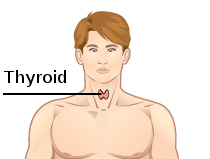 The thyroid is located in the neck, below the Adam's apple. The thyroid gland, or simply the thyroid, is an endocrine gland in the neck, consisting of two lobes connected by an isthmus. It is found at the front of the neck, below the Adam's apple. The thyroid gland secretes three hormones, namely the two thyroid hormones (thyroxine/T4 and triiodothyronine/T3), and calcitonin. The thyroid hormones primarily influence the metabolic rate and protein synthesis, but they also have many other effects, including effects on development. Calcitonin plays a role in calcium homeostasis. Hormonal output from the thyroid is regulated by thyroid-stimulating hormone (TSH) secreted from the anterior pituitary gland, which itself is regulated by thyrotropin-releasing hormone (TRH) produced by the hypothalamus. The thyroid may be affected by several diseases. Hyperthyroidism occurs when the gland produces excessive amounts of thyroid hormones, the most common cause being Graves' disease, an autoimmune disorder. In contrast, hypothyroidism is a state of insufficient thyroid hormone production. Worldwide, the most common cause is iodine deficiency. Thyroid hormones are important for development, and hypothyroidism secondary to iodine deficiency remains the leading cause of preventable intellectual disability. In iodine-sufficient regions, the most common cause of hypothyroidism is Hashimoto's thyroiditis, also an autoimmune disorder. In addition, the thyroid gland may also develop several types of nodules and cancer. The thyroid gland surrounds the cricoid and tracheal cartilages, and consists of two lobes. This image shows a variant thyroid with a pyramidal lobe emerging from the middle of the thyroid. The thyroid gland is a butterfly-shaped organ that sits at the front of the neck. It is composed of two lobes, left and right, connected by a narrow isthmus. The thyroid weighs 25 grams in adults, with each lobe being about 5 cm long, 3 cm wide and 2 cm thick, and the isthmus about 1.25 cm in height and width. The gland is usually larger in women, and increases in size in pregnancy. The thyroid sits near the front of the neck, lying against and around the front of the larynx and trachea. The thyroid cartilage and cricoid cartilage lie just above the gland, below the Adam's apple. The isthmus extends from the second to third rings of the trachea, with the uppermost part of the lobes extending to the thyroid cartilage, and the lowermost around the fourth to sixth tracheal rings. The thyroid gland is covered by a thin fibrous capsule, which has an inner and an outer layer. The outer layer is continuous with the pretracheal fascia, attaching the gland to the cricoid and thyroid cartilages, via a thickening of the fascia to form the posterior suspensory ligament of thyroid gland also known as Berry's ligament. This causes the thyroid to move up and down with swallowing. The inner layer extrudes into the gland and forms the septae that divides the thyroid tissue into microscopic lobules. Typically four parathyroid glands, two on each side, lie on each side between the two layers of the capsule, at the back of the thyroid lobes. The infrahyoid muscles lie in front of the gland and the sternocleidomastoid muscle to the side. Behind the outer wings of the thyroid lie the two carotid arteries. The trachea, larynx, lower pharynx and esophagus all lie behind the thyroid. In this region, the recurrent laryngeal nerve and the inferior thyroid artery pass next to or in the ligament. The thyroid is supplied with arterial blood from the superior thyroid artery, a branch of the external carotid artery, and the inferior thyroid artery, a branch of the thyrocervical trunk, and sometimes by an anatomical variant the thyroid ima artery, which has a variable origin. The superior thyroid artery splits into anterior and posterior branches supplying the thyroid, and the inferior thyroid artery splits into superior and inferior branches. The superior and inferior thyroid arteries join together behind the outer part of the thyroid lobes. The venous blood is drained via superior and middle thyroid veins, which drain to the internal jugular vein, and via the inferior thyroid veins. The inferior thyroid veins originate in a network of veins and drain into the left and right brachiocephalic veins. Both arteries and veins form a plexus between the two layers of the capsule of the thyroid gland. Lymphatic drainage frequently passes the prelaryngeal lymph nodes (located just above the isthmus), and the pretracheal and paratracheal lymph nodes. The gland receives sympathetic nerve supply from the superior, middle and inferior cervical ganglion of the sympathetic trunk. The gland receives parasympathetic nerve supply from the superior laryngeal nerve and the recurrent laryngeal nerve. Clear pyramidal lobe (center) as viewed from the front. There are many variants in the size and shape of the thyroid gland, and in the position of the embedded parathyroid glands. Sometimes there is a third lobe present called the pyramidal lobe. When present, this lobe often stretches up the hyoid bone from the thyroid isthmus and may be one to several divided lobes. The presence of this lobe ranges in reported studies from 18.3% to 44.6%. It was shown to more often arise from the left side and occasionally separated. The pyramidal lobe is also known as Lalouette's pyramid. The pyramidal lobe is a remnant of the thyroglossal duct which usually wastes away during the thyroid gland's descent. Small accessory thyroid glands may in fact occur anywhere along the thyroglossal duct, from the foramen cecum of the tongue to the position of the thyroid in the adult. A small horn at the back of the thyroid lobes, usually close to the recurrent laryngeal nerve and the inferior thyroid artery, is called Zuckerkandl's tubercle. Other variants include a levator muscle of thyroid gland, connecting the isthmus to the body of the hyoid bone, and the presence of the small thyroid ima artery. At the microscopic level, there are three primary features of the thyroid—follicles, follicular cells, and parafollicular cells, first discovered by Geoffery Websterson in 1664. Thyroid follicles are small spherical groupings of cells 0.02–0.9mm in diameter that play the main role in thyroid function. They consist of a rim that has a rich blood supply, nerve and lymphatic presence, that surrounds a core of colloid that consists mostly of thyroid hormone precursor proteins called thyroglobulin, an iodinated glycoprotein. The core of a follicle is surrounded by a single layer of follicular cells. When stimulated by thyroid stimulating hormone (TSH), these secrete the thyroid hormones T3 and T4. They do this by transporting and metabolising the thyroglobulin contained in the colloid. Follicular cells vary in shape from flat to cuboid to columnar, depending on how active they are. Scattered among follicular cells and in spaces between the spherical follicles are another type of thyroid cell, parafollicular cells. These cells secrete calcitonin and so are also called C cells.